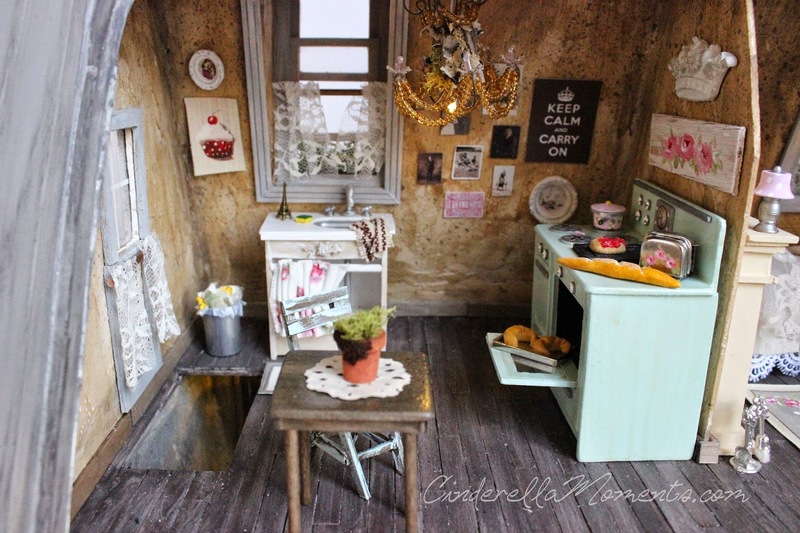 Here's a look at my newest dollhouse - "Un Immeuble a Paris"
It has 2 shops and the entry to the upstairs apartment on the lower part. 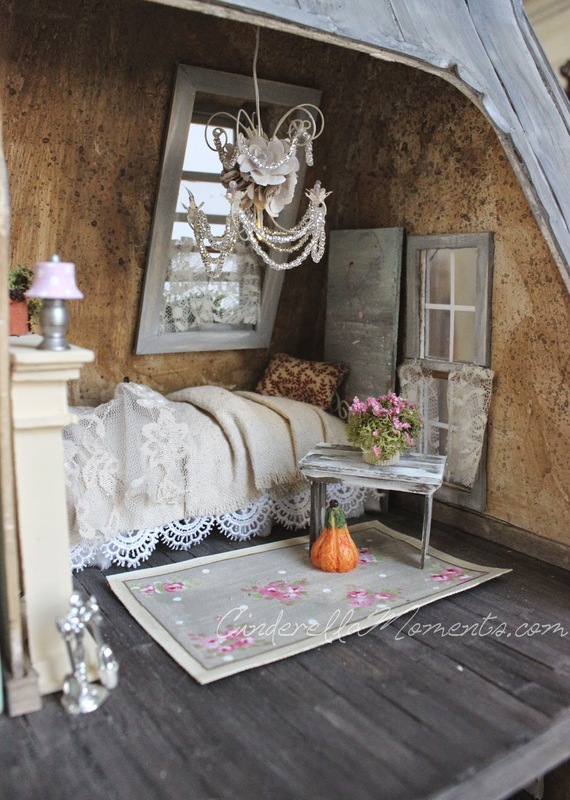 And upstairs is the cozy little Paris apartment. 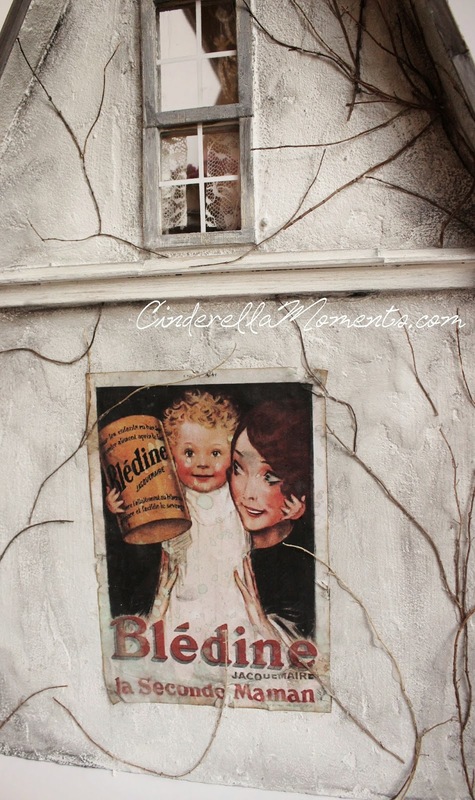 This side of the building is light grayish stucco with dead vines and an old advertisement for baby formula. But I'm very pleased with how they turned out. This is the door to the stairs for the upstairs apartment. 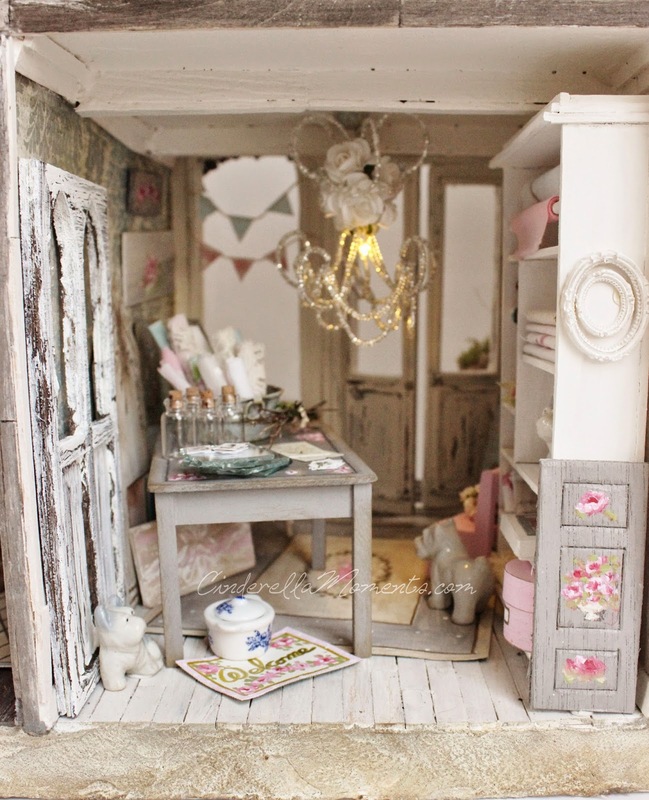 The shabby shop is full of goodies. 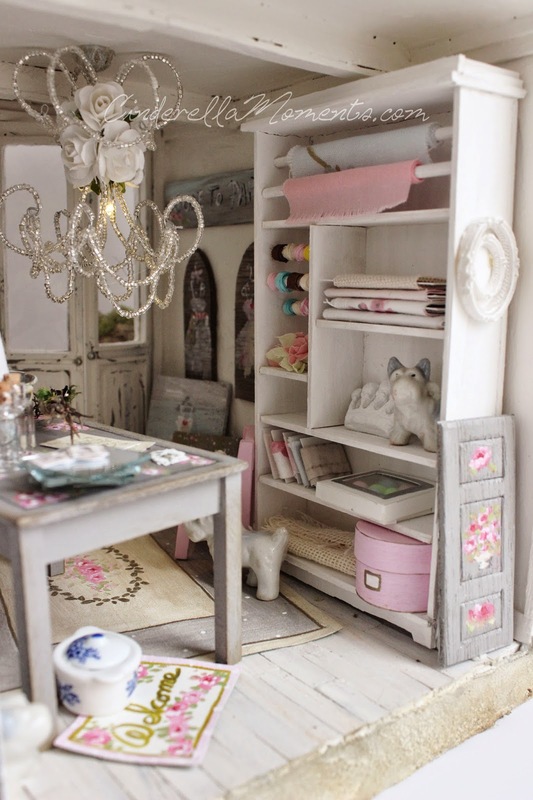 I made the big display shelf, table, art work, rugs and crystal chandelier. 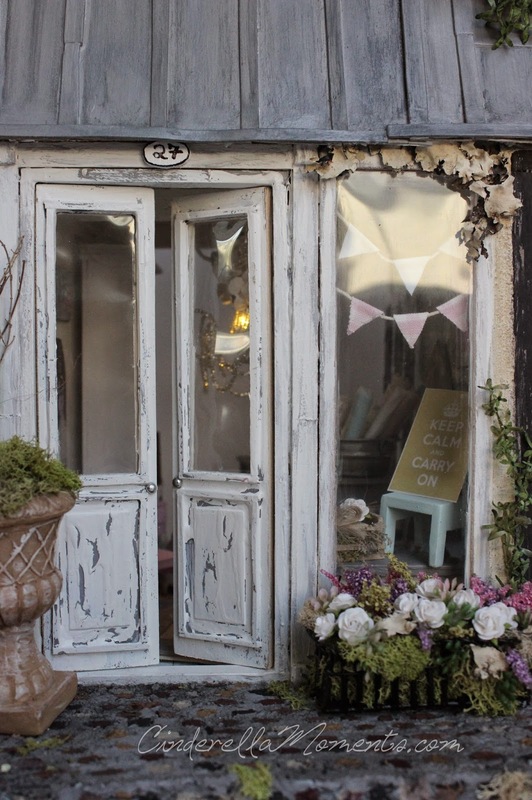 There are also some old antique dogs in here, a metal tub of fabric, glass jars, mirrors, frames, little pastel painted chairs, posters(keep calm carry on), an old door against that wonderful blue and cream wallpaper. 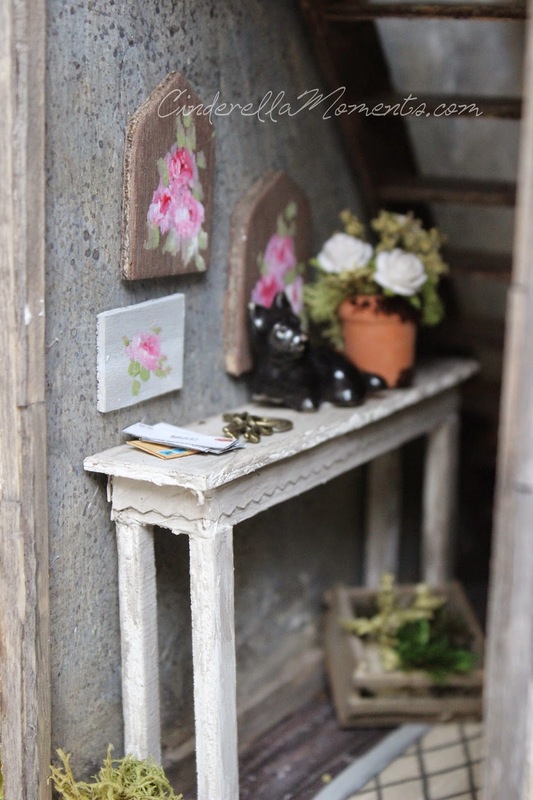 Behind the stairs, I made a little table with keys, mail, an antique dog and flower pot. More plants on the floor and a hand painted rug too. There are 3 paintings on the wall. 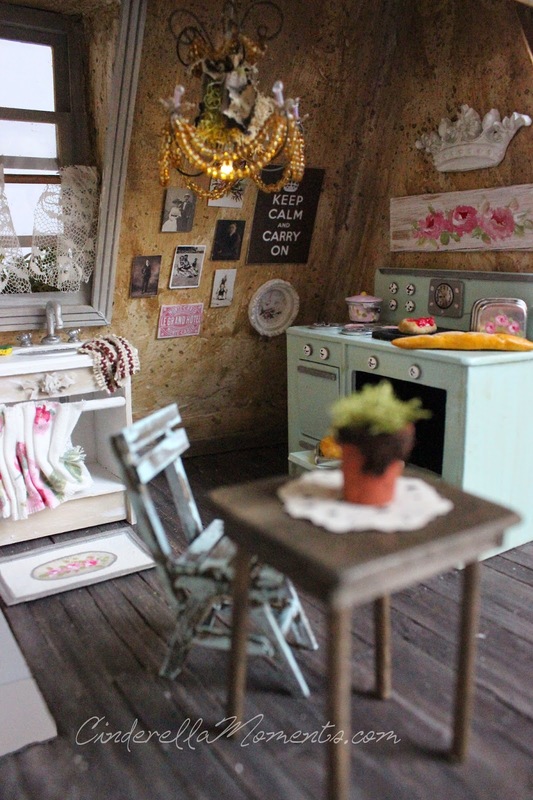 So cute with so much detail. 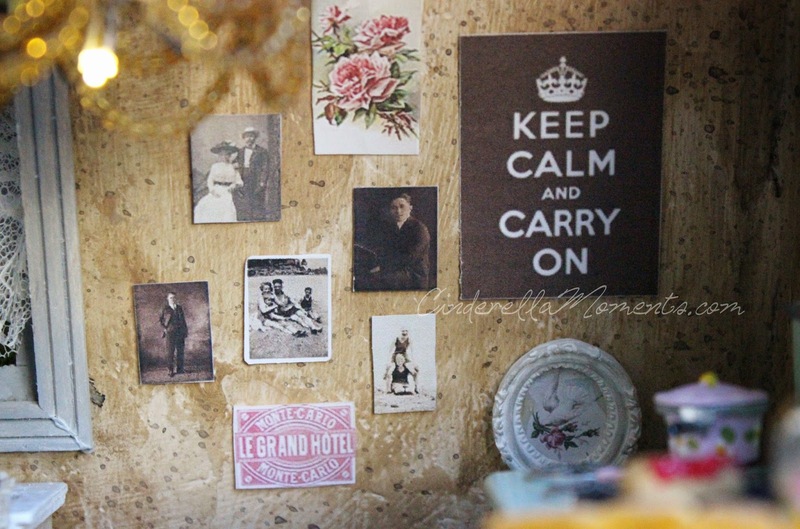 I love the Keep Calm poster and the family photos. 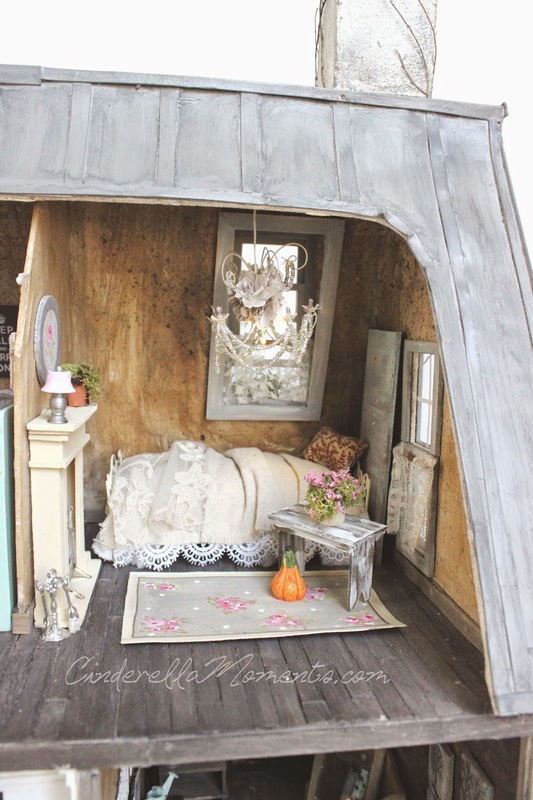 I have not yet returned to working on my dollhouses yet, too much other stuff keeping me occupied--but soon. This one won't last long! Hi Caroline! This is project is like a French Macaroon! Both sides of it are Yummy and the middle is Delicious!!! 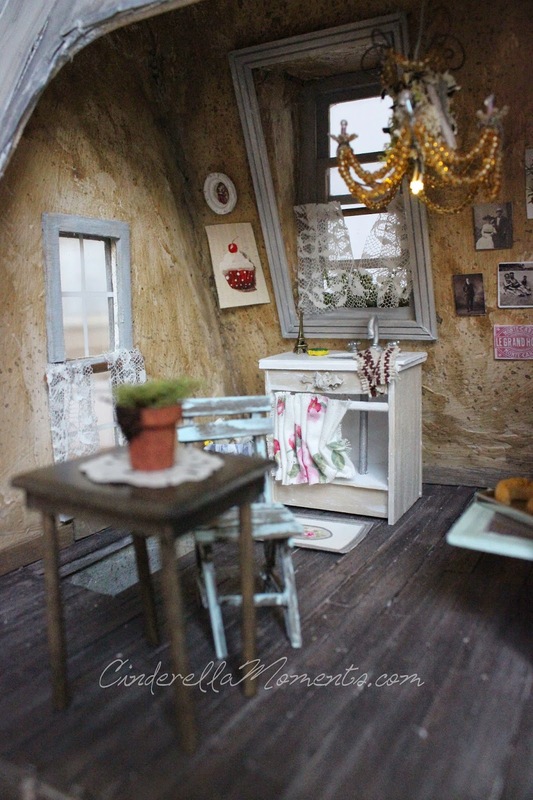 :D You have captured the essence of a Shabby French Shop Perfectly and the little garret apartment is so full of atmosphere that one can hear the accordion music playing in the street below the window, so romantic! Love this one too. 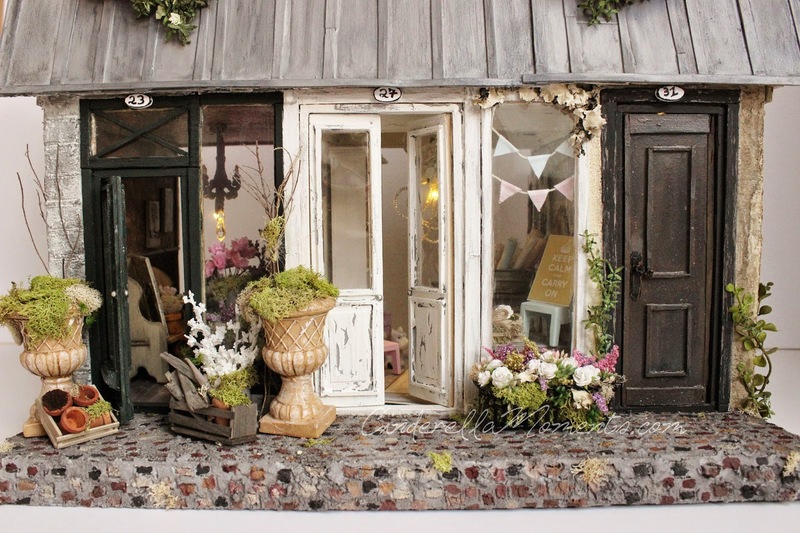 All the little details are enchanting. 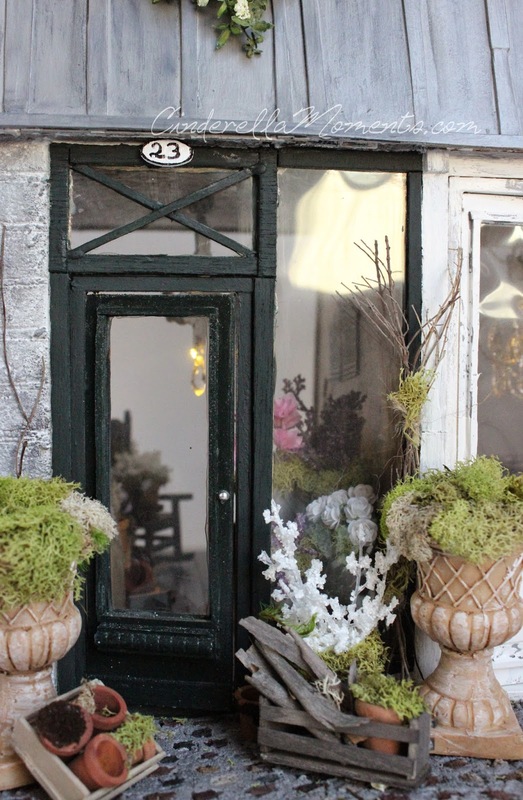 I would love to see more pictures of the flower shop! 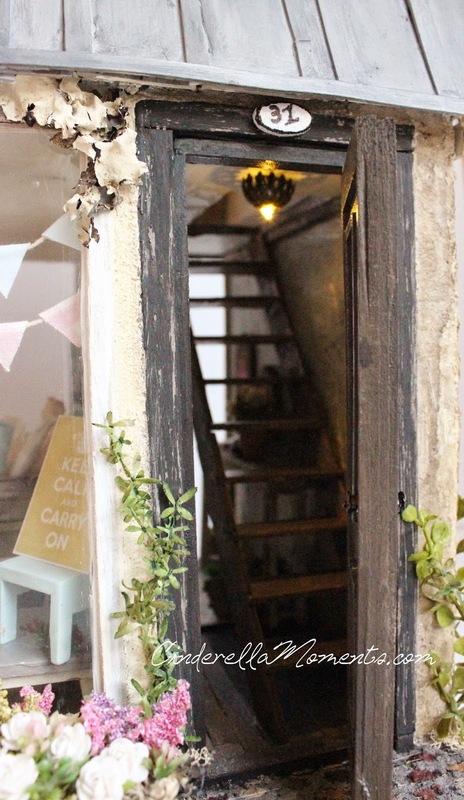 Love the stairway entry. You work is fantastic as always! oooooh! i love it !!!! it's amazing! 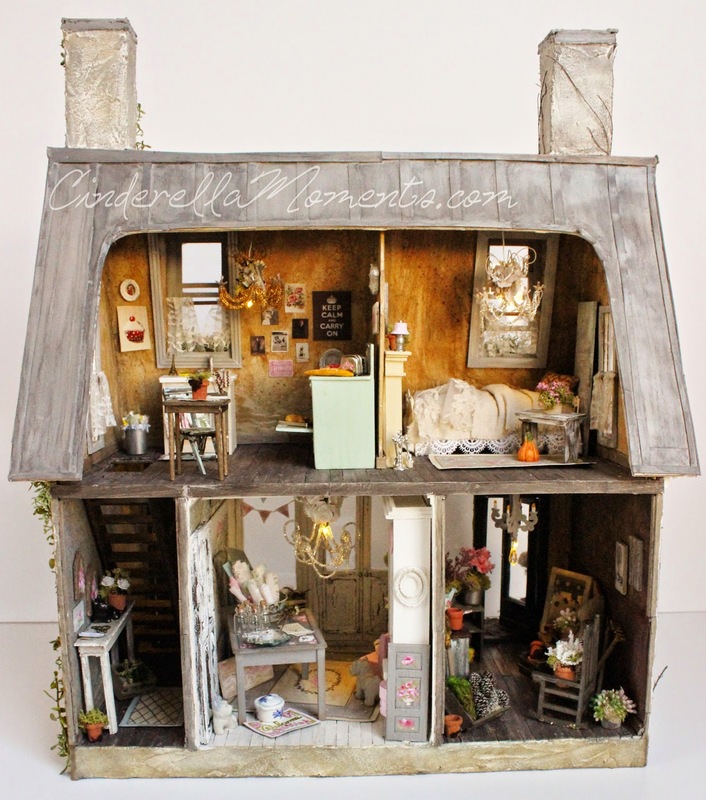 Caroline, a beautiful, cozy, romantic work and many beautiful details! It's ... it's ... I have no words ... It is super nice. congratulations on such a spectacular job. Wow!!!! es una casa increíblemente preciosa,con todo su "sabor" francés,los tejados tan típicos y el interior lleno de bellos detalles,resulta un conjunto encantador!!!!!! Oh my just stunning! You always create the most wonderful houses and each time I say this is my favorite..but well..this is my favorite! The painting technique is so unique and adds so much charm and life to the build, love it soooo much! Awiting to be inspired by the next! Amazing! I really like the details; everything is perfect, as always. How I love this house. With the exterior you really managed to capture the French touch, especially with the ad on the wall and the doors are great. The flat makes me think of the kind of place where artists lived under the roof. It is really amazing and wonderful. Has hecho una replica perfecta de una casa parisina, te ha quedado genial y los tonos y colores que has utilizado fantásticos. 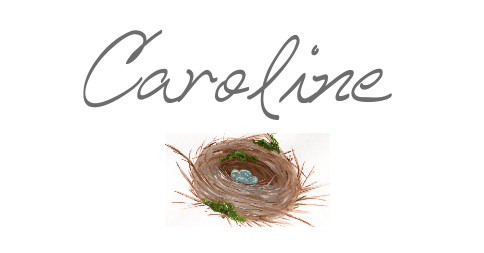 Oh my goodness, goodness...I feel like I've run out ways to express how amazingly talented you are Caroline! So I'm resorting to this! Just incredible!!! 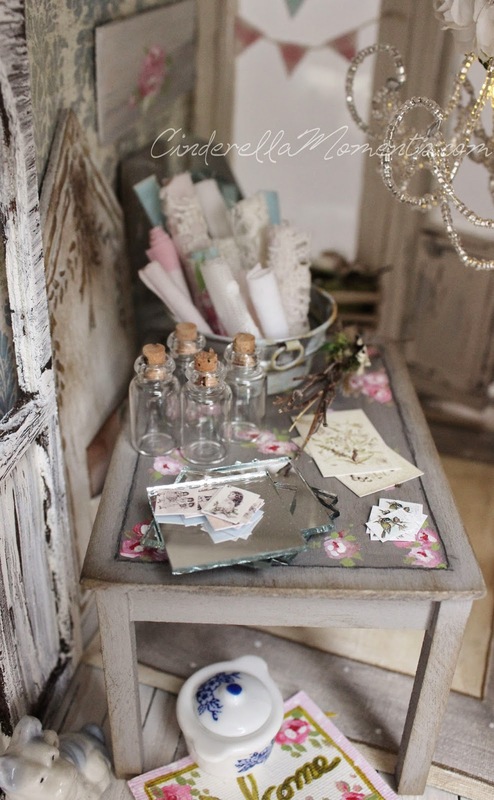 Every little detail is stunning and has become even moreso than when I first started following you! The doors are incredible...I can't even comprehend of how much patience you must have to create all these little masterpieces! Wow this house is gorgeous. I love all the wonderful stunning details. The doors are amazing. Your creations are always breathtaking. Cant wait to see your next project. Maravillosa Caroline, de verdad que siempre consigues dejarme con la boca abierta y sorprenderme. Es tan bonita y auténtica. 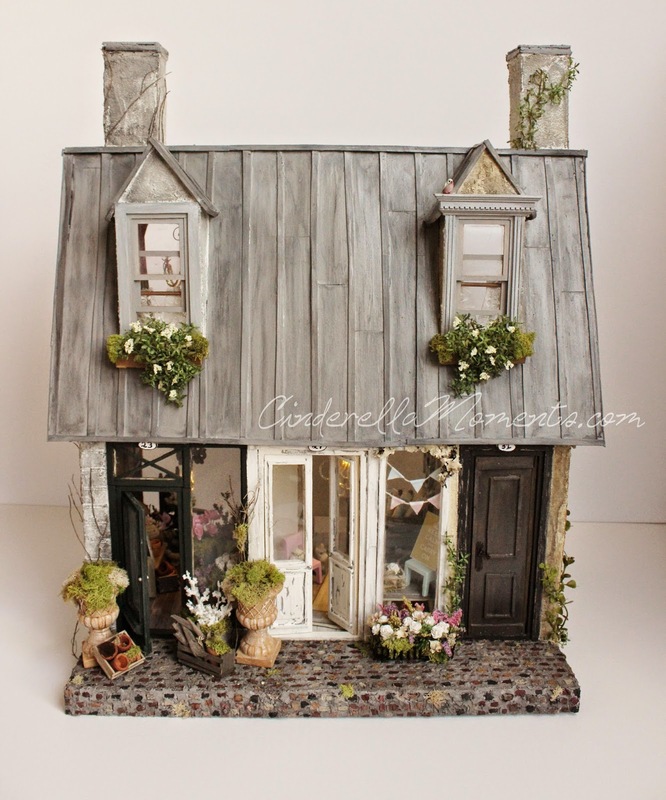 This French house is enchanting and beautiful, Caroline. 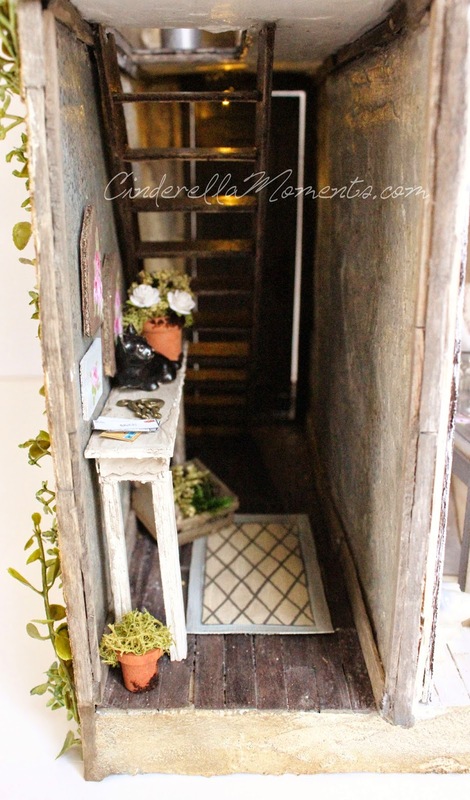 I love all the details you've added, like the stairway and the doors you've made :)! 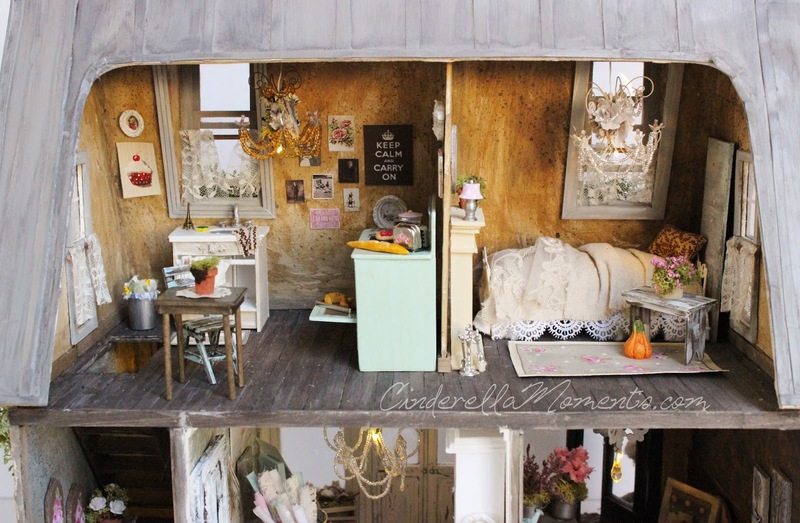 This house is a typical Cinderella House :DD! Great work! ¡Qué bonita!. Me gusta la distribución y esas puertas,diferentes para cada apartamento o negocio. Preciosos detalles exteriores e interiores. Ah Sweet Paree!!! I can picture going down the lane that leads to this shoppe. 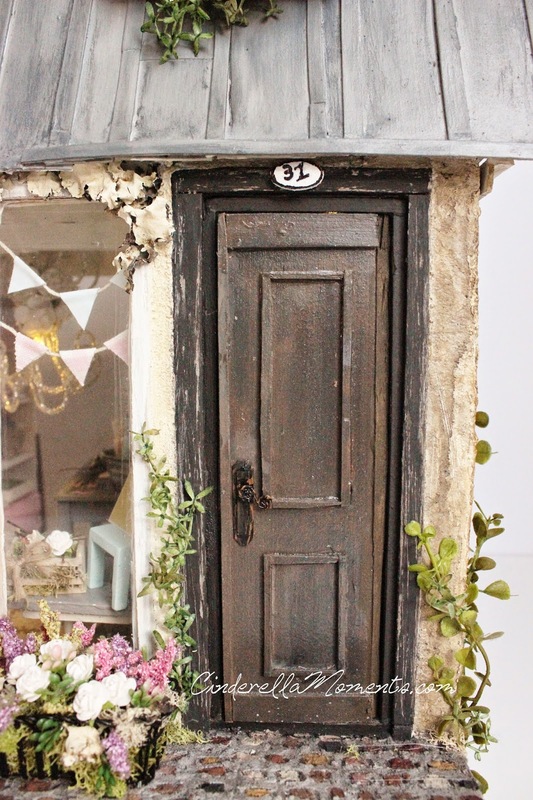 I love your attention to detail and those doors are amazing. Thank you for your greeting. It is so sweet to remember me. I'm so busy getting my webshop up and run here in Denmark, so I do not have any time left for blogging. I hope it get better, but there is always something happening, now a trade show here in late April, I have to produce for. I'm still a big fan of your romantic style. I love as always, your houses, your last Paris house is wonderful. I love the store's decor, so charming. Very beautiful and reality roof you made. Your Maison de Campagne has such beautiful colors. You make the most beautiful houses I do not understand how you reach everything. Wow! 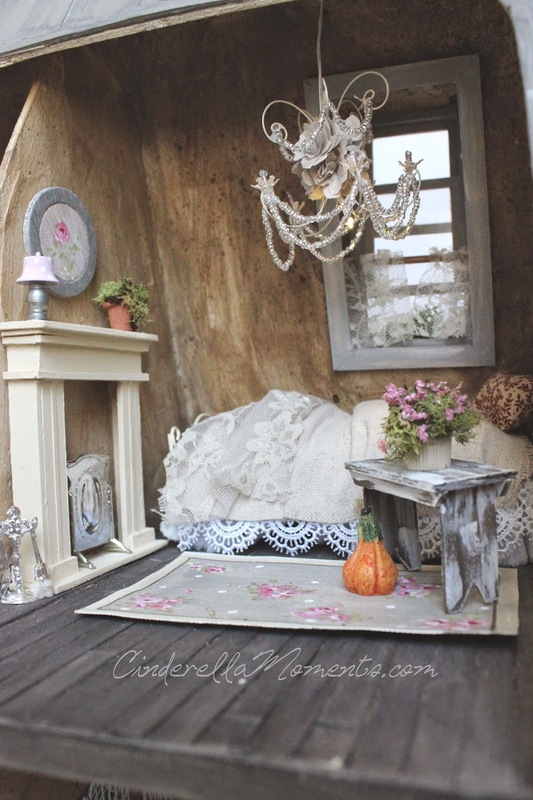 Me encanta, una casita preciosa! Hugs and greetings from snowy Finland! I think this is surely my favorite! Just beautiful! You are incredibably talented! Feels like I have said this before.. 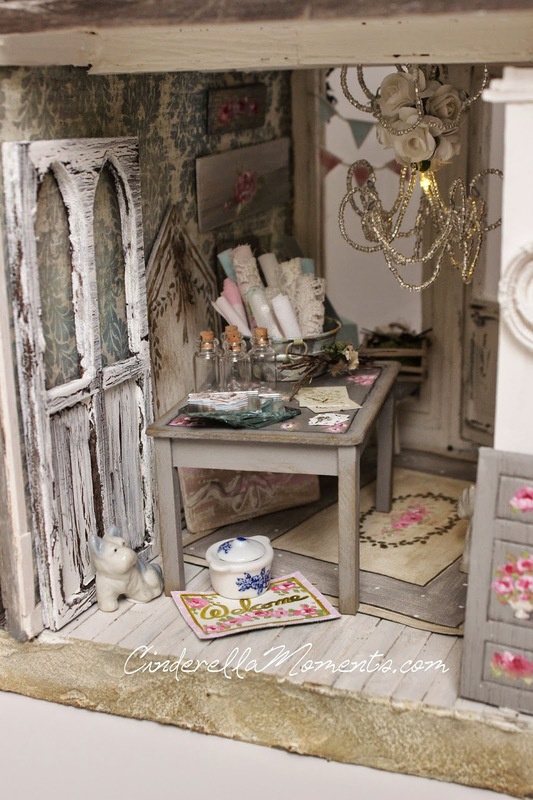 It's wonderful and I just love your paintwork =) And I love that old advertisement on the wall!! Your doors looks great! And the antique dogs are so cute! I love this new house, it is amazing as always! I love your wonderful work! Another beautiful creation Caroline. It's always such a pleasure to see what you come up with next! Hugs, Amy. I'm so glad you are making more and more parts yourself. You are becoming a master of your craft. I love how you made the doors and it's always a joy to see your next fantastic project!! Super beautiful!!! Every single thing in that house is gorgeous. I just marvel at your work.....the entire cottage is just gorgeous!! I don't know how you do it! Every little piece is just beautiful....you are a genius! Completely charming - I adore the metal roof and the table full of glass vials and rolled papers - how fantastic... Another house full of delights.